Last year, the West was the best. The only cities to break the 3 percent increase mark were San Francisco and San Jose, Calif., as well as Austin, Fort Worth and Houston, Texas. The lone surprise on the East Coast was Charlotte, which ended 2012 with a 3.1 percent increase in annual relative job growth from the previous year. 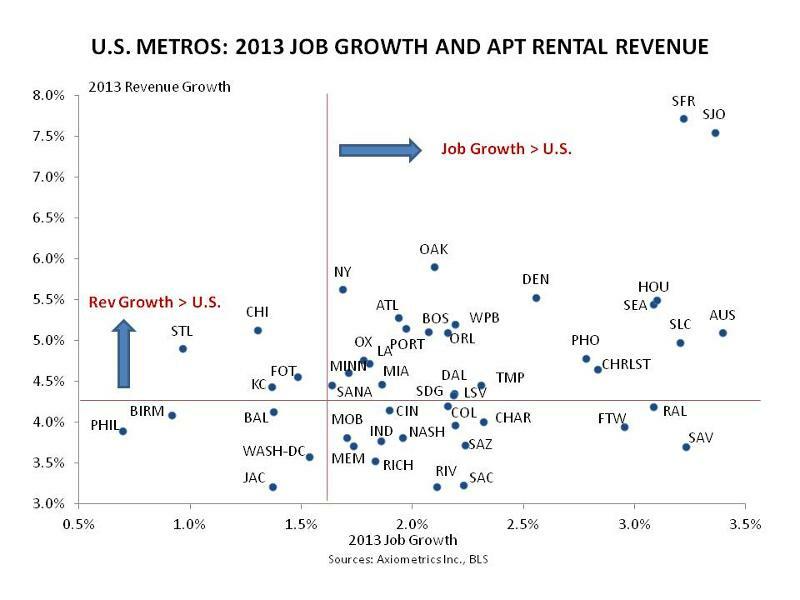 When revenue growth is factored in, Silicon Valley and Texas lead the way. Unfortunately for Mid-Atlantic cities, 2013 will lag in terms of growth potential, with major rental hubs like Washington, D.C., Philadelphia, Pa., and Baltimore, Md. trending toward the lower end of the combined spectrum. Yet, 2013 has good things in store for Seattle, Salt Lake City, Raleigh-Durham, and Savannah, which are all expected to see 3 percent or more job growth this year. This entry was posted on Wednesday, January 30th, 2013 at 5:10 pm and is filed under ECONOMY - US, Investment Properties, US - COMMERCIAL NEWS. You can follow any responses to this entry through the RSS 2.0 feed. You can leave a response, or trackback from your own site.